Andrew and I started watching Doctor Who this year and we were completely sucked into the world. It had been on our watch list for a long time, but we finally decided to delve in right after we got home from San Diego Comic Con. We watched it nonstop whenever we could and ended up breezing through all seven seasons in only a few months. Now we're all caught up and we can't wait for the 50th anniversary special coming up in November. Not only will it include the current eleventh doctor, Matt Smith, but it will also have our absolute favorite doctor: the tenth doctor, David Tennant! If you haven't caught the trailer yet, you need to. It looks absolutely amazing. Andrew had his mind made up for months that he was going to be David Tennant for Halloween, but not just any costume would do. His expectations were incredibly high and nothing would do unless it was almost exactly like the actual suit. This meant that he wanted me to make him a replica suit with pricey fabric which gave me so much anxiety since I haven't ever attempted to make anything like a suit before. With time ticking away, Andrew needed to decide what he wanted to do: buy a suit that would do for now or spend more for one that is bound to be imperfect. Ultimately, he decided to save up (and give me more time) for his perfect tenth doctor costume for next year. The tenth and eleventh doctors! Never fear, Andrew didn't give up the Who-themed Halloween costumes for this year. He decided to just wear his eleventh doctor costume I made him for Salt Lake Comic Con instead. With that finally decided, I had to decide what I wanted to do. There were a couple of ideas I could have done but I wasn't excited by anything until Andrew came across THIS after googling for Doctor Who cosplay. I saw it and immediately decided that I wanted to be David Tennant which made Andrew incredibly jealous. It was perfect in honor of the 50th anniversary special which was my excuse. As in previous years, Jadon was pretty set on what he wanted to be for Halloween very early on in the year. 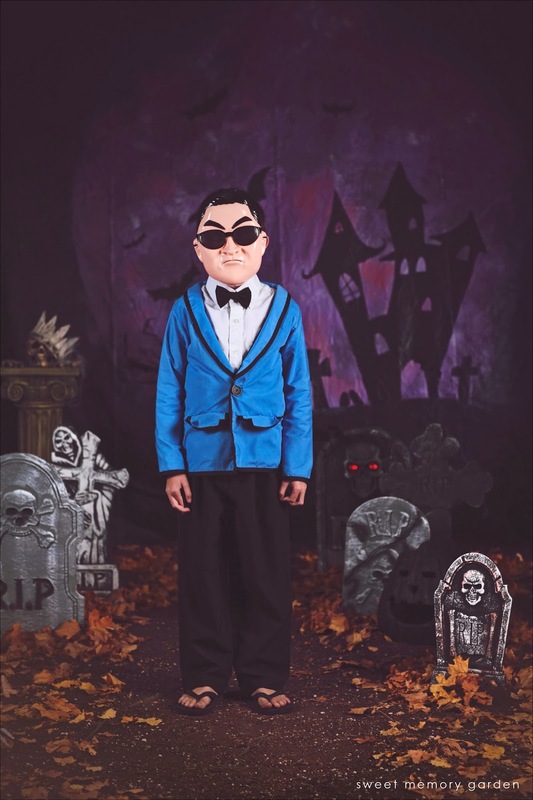 In about March, he decided to be Psy, the Korean singer who sings "Gangnam Style." Jadon loves that song and music video so much that he knows the whole thing and can reenact the music video himself. For his costume, I originally just went to the local thrift store to buy him a basic suit. He had black pants, a navy blue jacket that I was going to add black trimming to, a white button up shirt, and navy blue suspenders. It wasn't super Psy-ish, but he was happy enough to wear it to Rowley Con. When October came around though, I had finished up all our costumes so I decided to make him the very recognizable powder blue jacket with black trim that Psy wears. That paired with an awesome mask our friends brought back from Korea completed the outfit perfectly. Jadon received recognition at school for his costume in what I think is the best character category. The paper he brought home wasn't super specific, but he didn't care either way. Isabelle has also proven to be just as creative with her Halloween costumes. She ultimately decided that she wanted to be a "pink girl jumping unicorn." If anyone called her anything different, she was sure to correct them. The hardest thing about her costume was coming up with how to make it. After I figured out what I was going to do, it only took a couple of days to accomplish it. She was iffy on some of the shades of pink I used, but she loved it in the end. She was also super excited when she won the Cutest Costume award at the annual Sabin Halloween party. After I explained to her what a costume contest was, she replied by saying that she hoped everyone liked her costume. It was the cutest thing ever. She came away with a shiny new medal and a Mr. Potato Head pumpkin decoration.